Italy is one of the most picturesque, unique and charming countries in the world. If we add an extraordinary history, a delicious gastronomy, the glamor of its people, a seductive language and that particular light that only radiates the rich color palette of certain points of the globe, we would be by definition in Le Cinque Terre. Benvenuti to the medieval jewel of the riviera ligure. Nestled in the province of La Spezia lies a small and exquisite rugged region made up of five delightful coastal towns which, together with Portovenere and the islands of Palmaria, Tino and Tinetto, make up the Parco Nazionale delle Cinque Terre (“National Park of the Five Lands “), declared Patrimony of the Humanity (Unesco, 1997). Promontory, cliffs, coves, bays, ravines, reefs and beaches contribute to create a unique landscape bathed by crystal clear waters. Appealing to the sea from the foothills of the Apuan Alps – in the form of peculiar steep balconies set in terraces of cultivation (vines, olive trees) -, its people spend time quietly in this secluded corner for innumerable generations. 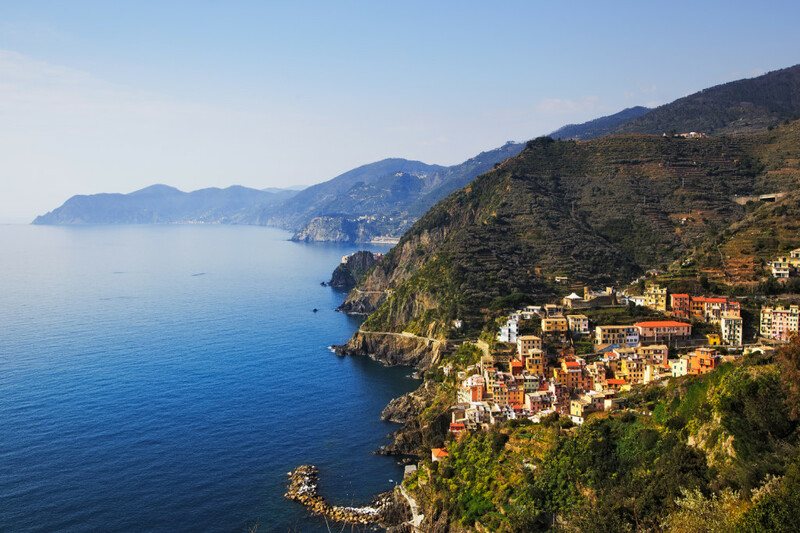 From Monterrosso al Mare, The largest town in the area, with its beautiful beaches – the largest and best, according to its name – and its spa. From the rocky spur of Vernazza, With its cliff, its natural harbor and its colorful houses, in which it is considered the most beautiful town of the whole. To highlight its old, noble and elegant. Founded around 1000 AD, from the fortezza (fortress) or the Genoese wall against the Saracen pirates, we can attend an indescribable sunset while we taste – with calm … – its wine vernaccia. From the small and centric Corniggia, whose name comes from Gens Cornelia, the Roman family has owned that place for centuries. Without contact with the sea but erected on a rock 300 ft surrounded by vineyards, from the same you can see the rest of villages as well as the magic blue of the Ligurian Sea. From the romantic and quiet Manarola, Also of Roman origin and seated in a small valley that empties in its reduced port, enclosed between two rocky spurs. An ideal place to toast is your Via dell’Amore. From Riomaggiore, founded by Greek fugitives, whose nucleus dates back to the s. XIII, with beautiful houses in different colors and levels – that follow the course of the stream Rivus Maior, from which it takes its name – that seems that they were to fall from moment to moment and to be engulfed by the brave sea. And to connect them all, a very pleasant and picturesque hiking route – approximately 6 hours long – that wanders encased between the foothills of the Apennines and the Mediterranean. It is recommended to choose the date of visit well, avoid agglomerations and carry out a good planning of the trip and all its logistics. The authorities are restricting the flow to the enclave in order to respect the environment and its sustainability.